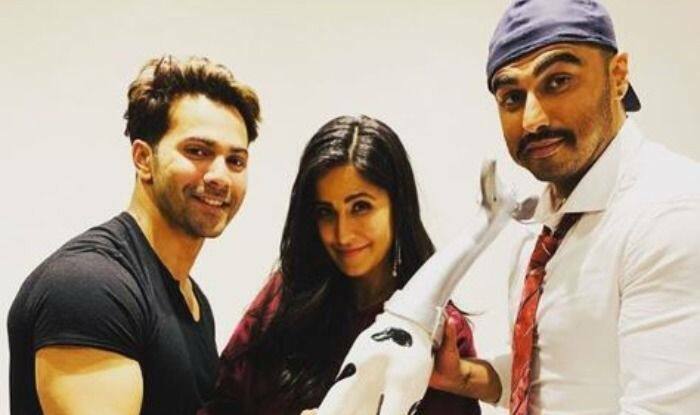 Arjun Kapoor and Varun Dhawan started a new Katrina Kaif fan club and also awarded her with a Dalmatian trophy which represents their "faithful friendship". Katrina Kaif has been winning hearts of many with her incredible dance moves and her sweet smile. The actor now has a huge fan following but was earlier called ‘arrogant’ for her introvert nature. Actors like Arjun Kapoor and Varun Dhawan had even made a club with the name, ‘We hate Katrina Kaif.’ The trio is now good friends and recently Arjun shared a picture of him and Varun awarding Katrina with a trophy and mentioned that Varun and he are starting a new fan club representing their ‘faithful friendship’. Varun and Arjun had earlier revealed on Karan Johar’s talk show that they had created a club called ‘We hate Katrina Kaif’ and stayed in the club for a long time. Now, sharing a picture of the three Arjun wrote, “So me & Varun are starting a new fan club #WeloveKK aka Katrina Kaif!! We are seen awarding her for absolutely no reason whatsoever.. PS- the dalmatian trophy represents our faithful friendship !!!”. On the professional front, Katrina will next be seen in Bharat with Salman Khan. Arjun is gearing up for Panipat. There are rumours doing the rounds that Arjun will be tying the knot with his rumoured girlfriend Malaika Arora on April 19. Reports suggest that Arjun and Malaika have given strict instructions to the team and asked them to keep their ceremony a completely private affair. Varun, on the other hand, will soon be seen in Kalank with Alia Bhatt, Sanjay Dutt, Madhuri Dixit Nene, Sonakshi Sinha and Aditya Roy Kapur. The film is slated to release on April 17.